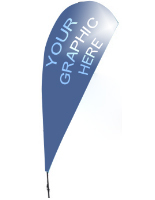 These Teardrop Flags Come With Fully Color Graphics! Each Banner is Printed Using a Digital Printing Process! 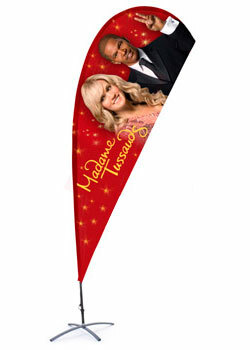 Many other Teardrop Flags Also Available! 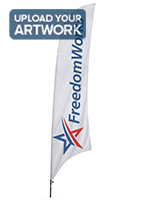 Includes a teardrop flag with full color, CMYK digitally printed graphics. Comes with a cross base and water bag, ideal for indoor use. Flagpole is lightweight and easy to assemble. These teardrop flags, also known as flying banners, offer a great opportunity to draw attention at indoor and outdoor events. 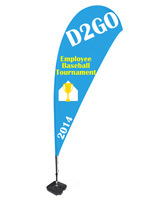 The shape of these pennants ensures that your images are always open and visible. 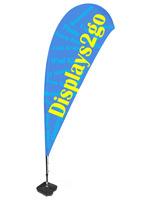 These teardrop flags are also lightweight, portable, and easy to assemble. 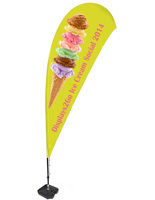 Each event banner comes with a 14-1/8' pole that gently curves to create the flying effect. These teardrop flags, once assembled, stand over 11' tall. An included bungee cord keeps your graphics firmly attached to the pole. 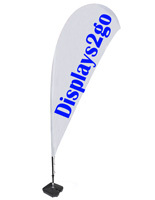 These teardrop flags come with a metal cross base and water bag for indoor use. This event banner is excellent way to advertise sponsors, new products, and upcoming events. 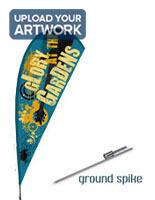 These teardrop flags are sold with custom graphics that are digitally printed with your artwork. Digital printing is offered for quantities smaller than 10, as it does not require a minimum order quantity like those units printed using the silk-screening process. Digitally printed banners are also a better choice for complex designs, photographic images, and artwork with gradients. The downside to digital printing is that it does not offer as high a color penetration as silk-screening. This means that while your images are visible on the back, they are not as vivid as the front. Replacement graphics are also available.